After a series of episodes that have escalated the danger and stepped back from procedural activity, Grimm is back to a more familiar groove this week with “Clear And Wesen Danger.” Once again, there’s a monster of the week who needs to be tracked down and it seems like the overarching plot is being conducted off to the side, except this time Grimm’s trying to build more of a synergy between its two sides. That’s a balance that the show hasn’t often struck—when its weekly cases are tied to Resistance/Royal/Wesenrein/etc. activity it’s usually more obvious that the episode is an outlier—and while it’s a little rocky in its transition, there’s compelling enough action and development that thing still seem to be going in the right trajectory. On the surface, the week’s case is fairly standard Grimm with another horrific wesen-related killing, though this one is enlivened by the presence of Jonathan Slavin as Wemlinger. It’s always nice when the show brings in more recognizable actors for its one-off villains, and Slavin’s style unassuming nebbishness plays well against the brutality of his actions. Longtime director Norberto Barba brings said brutality across early and often, as Wemlinger is a Gila monster-esque beast who can tear throats out with ease and operates much more on the feral side of things. A mid-episode scene in a gas station bathroom is a clear standout, shadows and blood taking on giallo overtones. Wemlinger’s claws also turn out to be complicated from a procedural standpoint. With Nick still on administrative leave after the events of the premiere, Hank’s assigned a new partner named Detective Pogue, whose theories about the case lead more toward gardening tools than natural weapons. It’s a bit of a frustrating step back for the show, which finally managed to get everyone in the know and move past the constant efforts to keep at least one person in the dark—now it’s Wu and Hank scampering around trying to push Pogue in a direction they can’t explain. Yet in its annoyance, it does expose a truth the team might not want to face, in that they’ve become dependent on Nick’s Grimm abilities to get them across the finish line on cases they’re a bit adrift without them. Thankfully for them, Nick is pretty terrible at staying off duty. He barely has time to get comfortable in his new awkward living situation (more on that later) and he’s called into the precinct to identify Wemlinger’s woge and then chase him down with Hank and Wu. While Nick’s better off working, putting him back in this role so soon after he was taken out of feels clunky, especially as Renard’s threats of suspension and even termination just roll off his back. Similarly annoying is the way he’s able to dismiss the FBI agents looking into Chavez’s disappearance, as he waves them away by essentially saying she was investigating him for murder of another FBI agent. As much as Grimm’s committing to its new changes, taking Nick out of the police entirely feels like such an upheaval of status quo it’s hard to think anyone would commit to that after everything else that’s happened. On a domestic front, things have settled into an uneasy truce with the birth of baby Kelly, as Adalind has taken up residence in Nick’s house. The awkwardness between the two is both palpable and entertaining to witness, and both David Giuntoli and Claire Coffee are enjoying having a lighter tone with each other after so much time at each others throats. (Adalind’s “Cheese is really good” wins for best delivery of the week.) The baby continues to be mostly a non-entity, there for a few longing glances and coos from various characters, so if the show does want to make Kelly another super-powered child, those powers are being kept under wraps. Adalind’s are still in play though, as “Clear And Wesen Danger” both clarifies their eventual return and adds an interesting wrinkle: she doesn’t want them back. In previous reviews I’ve been critical of both Adalind being adrift in the show’s story and Adalind losing her powers again after how much time it took for her to get them back, and Grimm finds a way to tie both of those things into character development. She’s lost a mother, a child, a career, and essentially any sense of stability in her life, and she’s as sick of her confused lot in life as the audience likely is—her line about how Rosalee is her only friend is easily the most heartbreaking moment of the episode. It doesn’t need to be some grand redemptive arc, it just needs to be a human one, and so far Coffee and the writers are making it convincing. The closing shot of the “For Sale” sign swinging outside Nick’s house—a choice motivated by a mix of Monroe’s advice and some bad Juliette flashbacks—indicates that the process of change continues on Grimm. 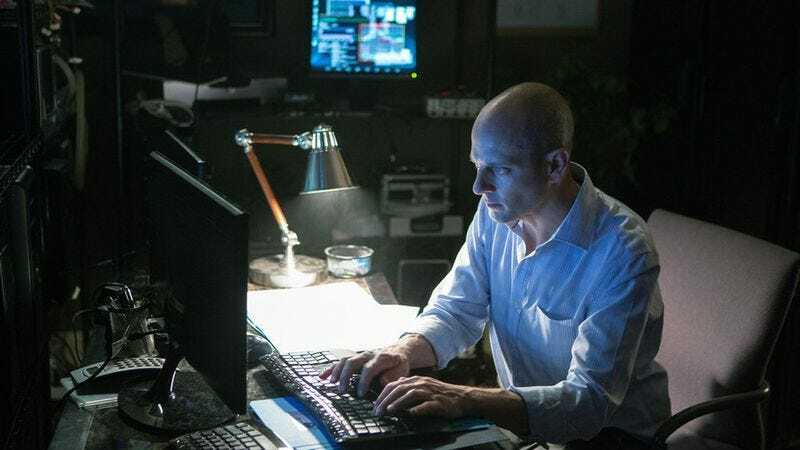 Not all of it goes smoothly in “Clear And Wesen Danger,” but it’s still pushing forward, and after the degree of changes that have already come to the show slowing down a little isn’t a bad idea. This Week In Portland: The apartment building Wemlinger’s hiding out in is the Melcliff Apartments, which—contrary to Wu’s directions—is located on SE 11th instead of NW 19th. While I didn’t remark on it last week, several of you noticed that the bearded man working with Chavez in the mysterious bunker is in fact Meisner, the high-level Resistance member last seen tossing King Frederick out of a helicopter in “Cry Havoc.” This adds a lot of new layers to the story: What connection does the Resistance have to all of this? Does this vague yet menacing government agency have Diana? What if anything does Renard know about this? And is it a good idea to tie this new plot so closely to the Resistance/Royal confusion? The Better Off Ted-shaped hole in my heart is a little disappointed that they couldn’t get Malcolm Barrett to stop by as another Quijada Vil. Good luck to Nick trying to find a new house in the current hell that is Portland’s housing market. I hope there’s an episode coming up with a realtor trying to sell Nick’s house and they have to go through every single act of violence that’s taken place in that living room.